I think the Roman (or Greek) pediment isn’t quite appropriate to the medieval architecture, as it was quite against it ideologically. Basically, medieval fortress is a functional, heavy stuff against assaults. A roman pediment of that triangular shape is more about showing the luxury and now is associated with knowledge, humanity and other eternal values. So you can see them at many representative buildings, which associate themselves with the ancient culture of Greece and Rome. @PKD and AJ1: thanks for the idea. i will try to make it with what you said. another update with new back mountains, new fort mountain and different angle. The composition is now quite good. Now you need to concentrate on modeling in my view. There is inconsistent in design between the 2 structures. Have a theme & stick with it. I expect to have less snow at where the water touches land. Give some rocks formation. thnx, but modeling of what? and what inconsistency of the front entrance? not matching the fortress? The 2 building looks like they are from different architectural style. Not meaning to be negative, but I feel you have not reach a level in architectural design to design your own style, & I feel it is better to pick up of an existing style, say Gothic, even wholesale replication of existing buildings, then create from imagination. Once you get better, then you can developed your own style. That’s my view. ** PLEASE NOTE ** This image has been rejected multiple times with this message, which you have ignored. Please do NOT submit this again until you have improved it significantly. If you continue to ignore these messages, your account may be suspended. Okay, firstly, I need some information from you. Did you do a concept for this? What is your goal with the image? Realism? An epic sense of scale? Or just a stylised fantasy scene? Since I don’t know the answers to these questions, I’ll assume you’re going for a realistic scene, and that you’re probably wanting a sense of scale, because an epic scale would be appropriate to the subject matter, artistically. After all, an image should always have a motive to begin with - this kind of subject matter lends itself to image that inspire awe. This critique will be pretty harsh, so take a deep breath and then read on. Something that all of these images have is an amazing sense of scale. We can see they’re big. The images also all have a beautiful atmosphere which not only enhances the sense of scale, but also lends the image an ethereal quality that’s artistically appropriate to the subject matter. The reason they look big is due to a number of factors. Firstly, the camera angles used. Wide angles enhance perspective by exaggerating the lines of an image. This immediately creates a sense of scale, because it makes the viewer feel small when looking into the image. Secondly, and more importantly, study the structures themselves. They’re complex and detailed. The small details help our brains to discern how large the overall structure is. Things like archways, bridges, windows, doors, wooden beams, the trebuchets, things which we call “set dressing”, trees, etc all help this visualisation of scale - they’re essential. There’s detail everywhere. And not only do the structures themselves contain elements in varying sizes to create a sense of scale - the surfaces do too. Notice the brickwork and weathering on the walls of the city; the bricks look tiny at this scale, as we’d expect them to, because the overall structure is gigantic. In the fifth image, the cliff faces are highly detailed, with proper layers of rock strata, cracks, slopes, and other realistic features of actual cliff faces. This makes us feel that they’re very tall. From a design perspective, the buildings are interesting. They’re also believable. Why? For a start, there’s no symmetry. The city of Minas Tirith in the first four images is a haphazard collection of structures that looks like it was built and probably partially re-built over a very long period of time. That’s cool. It gives the city a personality and a feeling of history. That reinforces the believability of it. It also looks like something that a pseduo medieval culture would be capable of constructing with their available resources. It’s the kind of structure we expect to see in a fantasy world, because it looks like it was built by ordinary people and the city looks like it’s grown over the centuries, as a city would. The city isn’t just stuck onto the side of a cliff face either - in places, you can see how the city has been built around the cliff, leaving areas of rock jutting out in places. This is particularly noticeable in the second image, around the bottom of it - notice how the little buildings are built onto mounds of rock? That’s a cool detail. It makes the city visually interesting. A good design is always interesting. It has little details that reward viewers who look at the image for longer than just a glance. These details also further reinforce the sense of scale overall. And let’s not just look at the structure, but at the mood of the images too. All of them have a distinct, epic atmosphere. Look at the lighting. Some of the images have visible sunrays beating down from the skies. Notice how there’s a fog effect in the top image, the way the buildings fade as they recede into the distance? Again, this helps the sense of scale but it also gives the image an atmospheric effect that makes it look more realistic as well as more aesthetically appealing. The aesthetically appealing part is possibly even more important than the realism, because generally speaking, having a more beautiful image is better than having a totally photorealistic image. Lighting and atmosphere are absolutely crucial elements of an image, as they set the mood within. Light is not just there to make an image not dark. It’s a creative tool in its own right which is used to give an image a personality, atmosphere, and tone. In the third image, look at the beautiful hazy white light shining upon the city - this light adds so much to the image. It gives us a feeling of how it would be to be standing there in the sun, looking up at this glorious white city. Studying images that inspire you and asking yourself why they work well is crucial. It helps you to understand what you need to put into your own work and gives you something to aim for. So let’s look at your work. Your models need work. All of them. Taking the time to model things properly is a pain, I know, but you really, really need to be patient and only move forward to texturing, lighting, etc once the models are really great. Don’t rush to make things look cool - every single step of the process must be focused on 100% and completed before moving on. Your models are essentially primitives (I’m going to ignore the ships for now), with a lot of repetition and an inconsistent sense of scale. I’m guessing your intention was to make a very large fortress, but your fortress doesn’t look large at all; it looks miniature. This is partly due to the repetitious geometry which makes it look “cute”, but more crucially it’s because of impossibly sized details like the battlements and doors. You have people there in front of the main door - it’s simply not practical to have a wooden door at that scale. Even if it were possible to construct (and I don’t think it would be anyway), it’d be nigh on impossible to open and close without a gigantic mechanism in place to move it. Fortresses need doors which can be closed quickly in the case of a threat. Bear this in mind. You have to think about how things are used when you’re designing them. Your battlements are also insanely large considering the size of the people - in fact, the battlements are one of the main details which is making your fortress look miniature. Battlements are for archers to take cover behind - yours are the height of about 20 men. Making the battlements the right size would immediately make the fortress look larger. When designing the main fortress structure, you need to consider what scale would be possible for them to construct when you’re designing things like arches, doorways, pillars, windows, etc. Even the grand temples of ancient Greece didn’t have pillars the size of the ones on your towers. Despite this being a fantasy image, you still need some kind of practicality when you’re designing structures, because it helps to engage the viewer. Try to avoid perfect symmetry - it’s not as visually engaging for scenes like this. You don’t need the whole thing to look completely asymmetrical though - you can keep the same basic shape of the main fortress, but adding things like minarets, buttresses, arches, windows, windows, windows, windows, windows and more windows, as well as other details asymmetrically will create a more natural, organic looking structure. 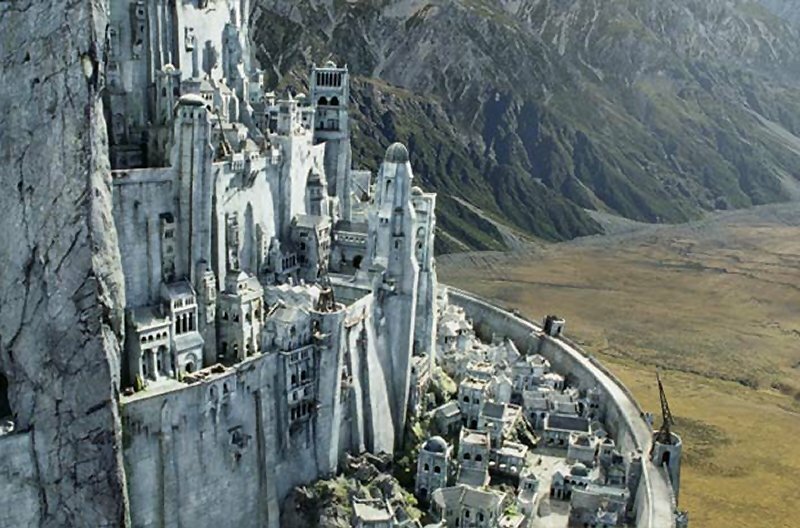 These Lord of The Rings city shots may be good references for this. I’d consider redesigning the entire main fortress. It’s too large. At the scale you have it, you essentially have a giant, enclosed square city. This just isn’t realistic. A more believable (and interesting!) 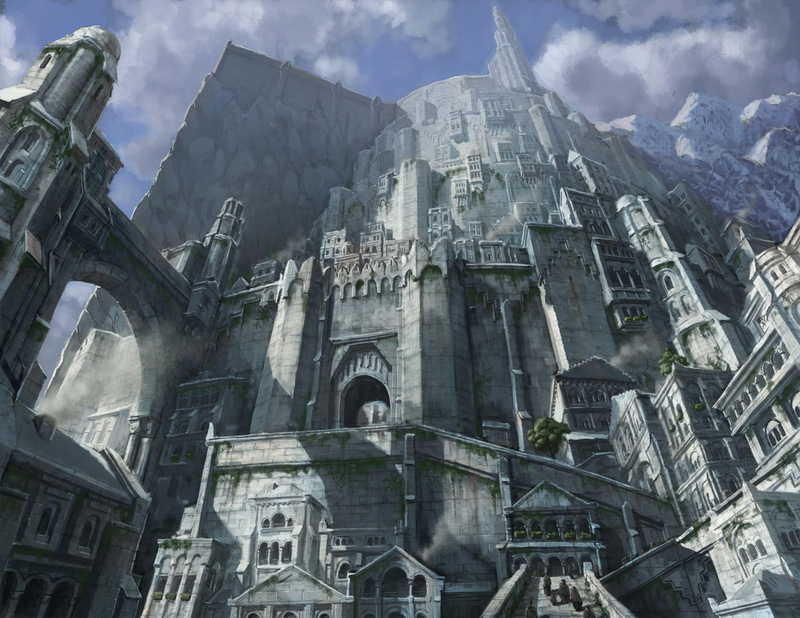 approach would be to have a clustered city with a main fortress right at the top, like the Lord of the Rings city. You could also consider adding additional structures along the length of the long stairway. Things like guard houses as well as dwellings, barracks, storage warehouses, etc could be placed in the middle of the image. Remember, these cities would be designed to withstand attacks, and they’d do this by building the city in a series of rings, each one enclosed by walls and gates, again like the city in Lord of the Rings (I’m repeatedly using this as an example due to it also being built into a mountainside like yours). That city is very well designed. It makes sense from a practical perspective, plus it just looks damn cool. Once you’ve sorted out the scale issues with the main structure itself, spend time adding additional smaller structures to it. You can do this from scratch or you could try a greebling plugin to get your base started and then you can edit the structures from that to match your design. When the buildings are done, add set dressing. For example, down at the docks, add things like barrels, rowing boats, wooden jetties, wooden cranes, maybe even some market stalls, and other things you’d expect to see at a port. You’ve got flags on the structure but again they’re scaled too large, which makes the building look small. You can have one or two big ones, but the majority should be small. Add defensive weapons like trebuchets down on the battlements - a fortress would never be without defensive weapons. You could also add wooden platforms, cranes and winches to the lower walls too. These could be for hoisting goods from the docks up onto the battlements without having to carry them up stairs. Once again, think about the practicality of your scene. People need to be able to get things done, so show how they do things. These details make your scene feel like a real, living environment. Aside from the buildings, your ships are too big and your mountain needs better structuring. Real mountains just don’t look like that. 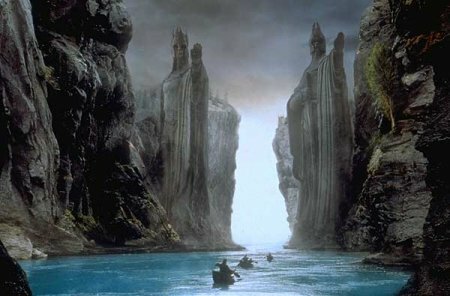 You need to enhance the sense of scale by adding details like trees, cliffs in places, better rock detailing, etc. No matter how realistic you get the fortress to look, the image won’t work if the mountain doesn’t look correct too. Once you’re done with your modelling, you’ll need to move to the texturing, shading and lighting, which each deserve their own long post like this, but I think I’ve already written enough! If you’re willing to take on board the advice I’ve posted here and to reconsider the modelling of your scene, then I’ll provide advice for the next steps once you’re ready. That’s one hell of a critique there. If you follow Leigh’s advice (as hard as it may be to go back so far) you could really transform your image. I would just add, try to keep referencing things like Leigh has posted here, and real locations as well as movie shots where all the design decisions have already been made by someone else. If you do that it will be far more obvious to you what you need to do to improve things. Look forward to seeing what you can do using this advice! thanks LIEGH for the critique and its helpful not harsh. and yes i only had the concept in mind not on sketch but will try to start again from sketches. it will be a long time since an update. i did a simple basic redo with paint over of what might look as in output. feedbacks are welcome. p.s. even am not submiting in showcase it still says awaitng validation. y? I would try pushing in the shot more. Like a lot more. Try placing the camera near the shore, widen the perspective, and aim it up. Your fort design seems recessive because of the inset roof. In your redesign, try to make it more intimidating and dominate by using tall, square shapes. thnx aj1, i just used the fort i design as a replacement and will redo the fort. and thnks for camera angle.